Our Soft Wash House Cleaning Services involves an application being applied to the entire house. Once the application has sat on the surface for 10 minutes, a light rinse is done from the bottom to top. The area of coverage would be any exposed foundation, all of the homes exterior surface, vinyl, brick, block or stucco. Soft Wash Systems use lemon scented sodium hypochlorite to help carefully dissipate algae (Gloeocapsa magma) that can grow on shingles. 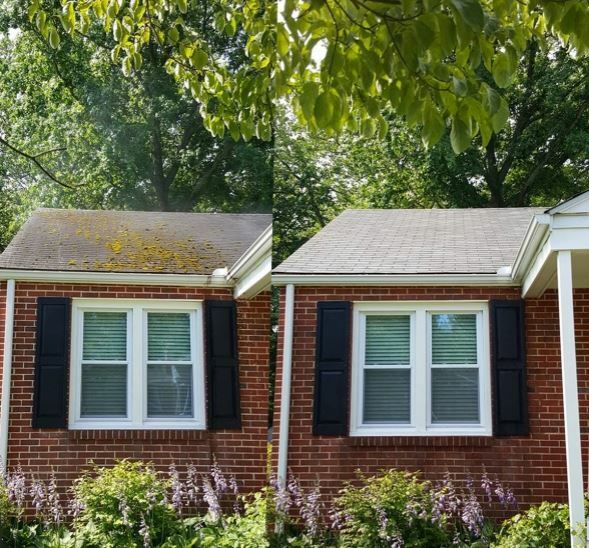 It is much gentler on your roof because it does not require high pressure washing to get it clean. Instead, the unsightly algae is dissolved and gently rinsed away with no harm to your existing roof. Instant results. Service area: New Castle, Newark, Bear, Middletown, Hockessin, Greenville and more in New Castle County, Delaware and parts of Delco and Chester County in Pennsylvania.